One of the biggest problems for an amateur off the tee is falling back on the shot, causing high fades or a generally poor connection. Here's a great drill to cure that issue. Set up how you would on a driver but with the ball resting on the ground rather than a tee. The normal setup would be for the ball to be just inside your left heel and your hands square or slightly behind the ball, as seen in the first image. The second image displays how to hit the ball correctly at impact with the weight moving towards the left side, hands forward of the ball, and the left shoulder still ahead of the ball. 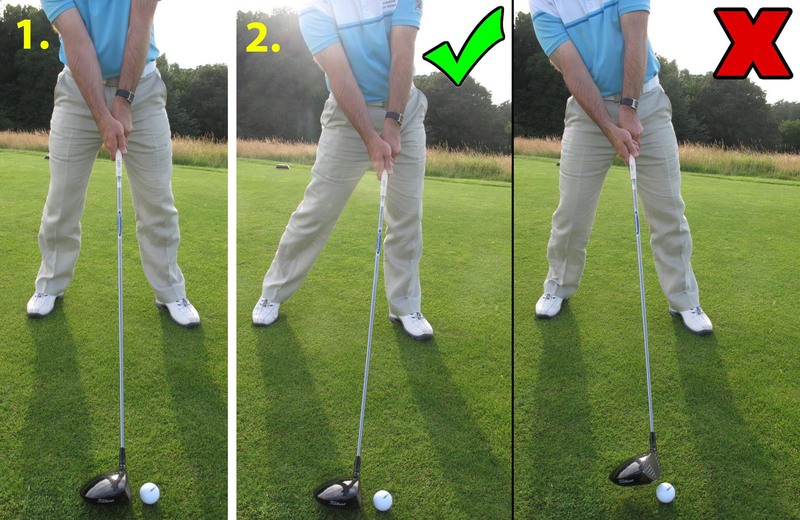 The image labelled with a Cross shows playing the shot whilst falling back - a common error made by amateurs when hitting the ball off the tee. Hitting the driver of the ground requires a lot of forward momentum and hitting down on the ball to compress it to get it flying through the air.